ALLENTOWN, Pa. –It looks like an I-Shift, it pulls like an I-Shift and it seems to have the IQ of an I-Shift -just don’t call it an I-Shift. Mack’s new mDrive automated manual transmission (AMT) is a spin-off of Volvo’s popular, 12-speed auto gearbox that was introduced to North America in 2006, and there are far worse things to be compared to. 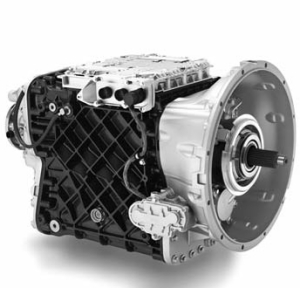 The I-Shift set the standard for automated transmissions upon its arrival on North American shores and the mDrive borrows heavily from its design, but with its own unique characteristics that make it distinctly Mack. The two-pedal, 12-forward speed mDrive has come charging right out of the gate since its announced launch at the Mid-America Trucking Show in March. McKenna said he projected the company would sell 50 units in the fourth quarter but it exceeded that estimate tenfold. One of the features that makes the mDrive a distinctly Mack offering is Easy Shift, a new shift algorithm that’s handy for liquid bulk and livestock haulers or for any other application where steadiness is important at low speeds. The feature basically ensures smooth shifts at low speeds with delicate loads. “With cattle, you don’t want to be shifting too hard and moving cattle around like a bunch of bobbleheads,” McKenna said of one suitable application. The mDrive also has Low-Speed Vehicle Modulat ion, which allows drivers to manually up-shift at low speed so they can idle around a yard more efficiently without struggling to find the right gear. “You don’t have to get into those situations where a guy’s revving the truck up to 2,000 rpm to take it around a fuel island,” explained McKenna. Like the I-Shift, the mDrive’s most impressive feature is its ability to hold a grade as the driver moves his foot from the brake to the throttle. I tested the Grade Gripper feature on a 15% grade at Mack’s new Customer Center, coming to a complete stop about halfway up the hill. When I took my foot off the brake, the Mack Pinnacle day cab -loaded to 78,000 lbs -held its own, giving me ample time (up to three seconds for the especially slow-footed) to get back on the gas. When I applied the throttle, it climbed seemingly effortlessly from first to third to fifth, right on through to tenth gear -with the exception of ninth, which the mDrive didn’t feel was necessary. If operating in Performance mode, the mDrive will hit every gear individually and will offer an extra 200-300 rpm at the shift point to help pull a heavy load up steep hills, something Canadian heavy haulers will appreciate. The mDrive is an engineering marvel, with the ability to take nine different variables into consideration each time it makes a shift, all within 1/100ths of a second. It has an inclinometer to measure the grade and it also reads: acceleration rate; speed; trailer connection; estimated weight; engine rpm and load; throttle position and other variables before determining when to shift and into which gear. Even a perfectly capable and experienced gear-jammer would have a hard time outsmarting the mDrive. Imagine doing algebra without a calculator; you may get the correct answer eventually but very few, if any, would get the answer as quickly as with some technological assistance in the form of a calculator. The Pinnacle I drove was powered by a Mack MP7 engine. The level of integration between the engine and transmission electronics is such that you can’t get an mDrive with any other engine and you won’t likely get any other automated transmission with a Mack engine either. Some customers have griped about Mack’s reluctance to offer the Eaton UltraShift Plus as an option but McKenna says with the initial popularity of the mDrive, customers now have a perfectly viable alternative. “We believe that the mDrive is a commercially viable product to the vendor offerings and so far, so good,” he said.